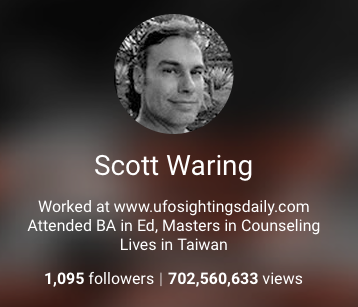 UFO SIGHTINGS DAILY: Aliens Watching Over UFO Sightings Daily Says Google Plus, Oct 2015, News. Aliens Watching Over UFO Sightings Daily Says Google Plus, Oct 2015, News. I went to my Google Plus today to talk to someone and my eyes were met with something really unbelievable. I now have 700,000,000+ people who have looked at me. Uh...I don't get it either. The only explanation is that there are alien species out there, watching what I do and say here. There is just no other explanation. Even my UFO site has only 30 million views, so...this is strange and cool. According to Google Plus I am the #1 most popular guy in the world. Yeah...I just laughed too, but its true. Team Coco (Conan) has 254 million, Gaga has 302 million, President Obama has 140 million. So all this fame...LOL, and everything is the same. Just the way I like it. Fame with anonymity. The only way to go.